Using the most advanced auto glass chip repair technology available in the world, Auto Glass Whitby is able to offer elite auto glass and windshield chip repair services which save you money and prevent the rock chip or crack from spreading and eventually shattering the entire auto glass or windshield. 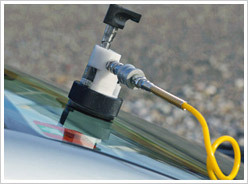 Our windshield replacement services are performed by certified and highly experienced windshield replacement technicians. Our windshields are world class and are backed by a lifetime warranty against any defects. Using the most advanced auto glass chip repair technology available in the world, Auto Glass North York is able to offer elite auto glass and windshield chip repair services which save you money and prevent the rock chip or crack from spreading and eventually shattering the entire auto glass or windshield. Many Canadians have problems with their windshields. It is very common to have attained a small crack or rock chip on your windshield. This is caused by small projectiles being shot out onto the street by other vehicles in-front of you. Usually, they are small pieces of debris from the road or small rocks or pebbles falling out of trucks. In case your windshield gets chipped or cracked here is what you need to do. Go on Google and look up auto glass shops in your city or town. Google goes beyond the call of duty to display the most relevant and popular auto glass shops in their local listings, allowing those near by to find reputable auto glass shops near them. 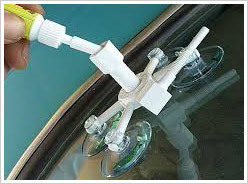 If you do not want to go to a professional windshield repair or replacement shop, you can go the cheaper route in the short term and use a do it yourself (DIY) auto glass repair kit. However, be aware that a DIY auto glass kit may be difficult to use and you may not do the best job, which could have very negative results. Although some DIY kits seem easy to use, they mostly don’t do a good job at preventing cracks from spreading long term, and this is something a professional auto glass shop can do for you properly. An improperly sealed crack can open up again slowly or significantly reduce the strength of the windshield which can make a rollover much worst and cause the roof to cave-in, and we have seen clients come to us after they tried fixing the crack themselves without success. At Auto Glass Whitby we have the tools, equipment and the proper cohesive materials that will prevent your small chip from spreading into a big crack and endangering you and your passengers. The windshield of a car is very similar to that of an aircraft or other form of transport. The windshield is usually made up of 2 pieces of curved glass and it has a plastic laminate glued in-between the glass. Then the windshield is glued into the frame of the vehicle as well. You can imagine that installing a windshield properly requires knowledge, experience and proper equipment so you should never attempt to replace your own windshield because the consequences can be fatal. A high impact acrylic glass is used in motorcycles so that it can be more aerodynamic and it is also used in some cars as well depending on the angle that the windshield is tilted. Windshields protect you and your family from many different dangers such as wind, heat, cold and flying debris. Not only that, but it also makes your car more aerodynamic to aid in fuel efficiency and speed pick-up. The reason why a small crack or ding in the windshield can become worsened quickly is by water seeping into the crack, and then once the sun comes out, the water becomes water vapour and expands the crack. A DIY kit is best for temporary repair but a professional should be consulted about it as soon as possible. With our free mobile auto glass service anywhere in Whitby ON, there is no need to waste your time and gas money driving your vehicle to our auto glass shop. We have mobile trucks that are fully equipped with auto glass replacement tools and machines, which allow us to repair any auto glass problem at your premises. Call to book a free mobile auto glass service.